The first stage of SpaceX's Falcon 9 rocket comes down for a successful landing on a robotic ship at sea on April 8, 2016. The epic rocket landing SpaceX pulled off today (April 8) is a big step forward in humanity's march out into the cosmos, company founder and CEO Elon Musk said. 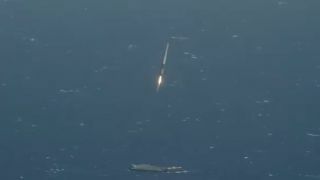 SpaceX managed to land the first stage of its Falcon 9 rocket on a robotic "drone ship" in the Atlantic Ocean during the successful launch of the company's uncrewed Dragon cargo capsule toward the International Space Station from Florida's Cape Canaveral Air Force Station this afternoon. "I think it's another step toward the stars," Musk said during a post-launch press briefing today. "In order for us to really open up access to space, we've got to achieve full and rapid reusability. And to be able to do that for the primary rocket booster is going to [have] a huge impact on cost." SpaceX has landed a Falcon 9 first stage once before, bringing the booster back on dry land at Cape Canaveral during a satellite launch this past December. But today's touchdown was the first successful drone-ship landing after four near-misses; similar attempts in January 2015, April 2015, January 2016 and March 2016 ended with the rocket hitting the drone ship but then toppling over and exploding on its deck. "The rocket landed instead of putting a hole in the ship or tipping over, so we're really excited about that," Musk said today. SpaceX would ideally like to land all of its rockets on terra firma, because doing so streamlines the testing and reflight processes significantly. But boosters on certain missions cannot carry enough fuel to make it all the way back to land, so it's important to be proficient at ocean landings as well, Musk said. "About half of our missions will need to land out to sea," he said. "Any missions that are going to, particularly, geostationary orbit or to escape velocity — anything beyond Earth — is likely to need to land on the ship." If all goes according to plan, the Falcon 9 that touched down today will be hauled back to shore on Sunday (April 8) — the same day Dragon is scheduled to arrive at the space station. The rocket stage will then be fired 10 times in a row on the ground at Cape Canaveral to assess its suitability for reflight, Musk said. Eventually, the company aims to refly boosters within a few weeks of touchdown, and to launch the rockets many times before retiring them. "I think almost everything on the stage will be good for 10 or 20 missions, and, with minor refurbishment, you could get to 100," Musk said. If SpaceX does achieve that level of reflight, the savings over traditional one-and-done launches will be huge. It costs only $200,000 to $300,000 to refuel a Falcon 9, Musk said, while the rocket itself costs about $60 million. SpaceX isn't the only entity working to develop reusable rockets. Blue Origin, the company established by Amazon.com founder Jeff Bezos, has launched and landed the same New Shepard booster three times, with the most recent such test occurring last weekend. But, as Musk likes to point out, New Shepard flies only to suborbital space; the Falcon 9 reaches greater altitudes and speeds on its orbital missions before coming back to Earth.